Organ donation means giving part of your body to someone else who needs it. This amazingly generous act saves thousands of lives in the UK every year. Anyone can register to donate their organs and tissue when they die, regardless of their age or medical conditions. To ensure that all donated organs are safe, the donor's medical and lifestyle history is assessed at the time of donation. Your family will be asked to support organ donation if, when you die, you are in a position to donate your organs. So make sure you tell them you want to be an organ donor too. Sadly, around three people every day die in need of an organ transplant. You can help us save and improve lives by signing up to become an organ donor and telling your family you want to donate. 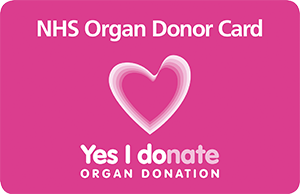 When you register for the first time we will send you an organ donor card. You can also download a digital version, or choose a digital card that reflects your faith or belief system. If you have lost your card or need a replacement, you can download and print a new card at home. Alternatively, you can call us on 0300 123 23 23 and request a new card. There are many different types of donation that will greatly enhance or save the life of the person who receives the transplanted organ or tissue. The majority of those who join the NHS Organ Donor Register choose to donate their organs. However, you can also choose to donate your tissues. Watch our myth-busting film in which specialist nurse Lucy addresses some of the most common organ donation myths and concerns. We've provided answers to some of the most asked questions about donating your organs and tissues. Get current UK statistics for organ donations and transplants. We will only use organs from a donor with their consent or with their family’s consent after they die. Learn more about what your consent to organ donation means. Having an illness or medical condition doesn't necessarily prevent a person from becoming an organ or tissue donor. Find out more about which medical conditions can affect your ability to donate.